Everything I own that requires 12 volts, I have converted to powerpoles. From tire pumps to solar chargers, rally cars to even an internet router or two – if it takes 12V, it’s got these connectors. They are fantastic, universal, genderless (technically hermaphroditic), and if you know anyone involved in Amateur Radio, they have a truck full of things that power or get powered by them. What this means is, in an emergency with emergency personnel, some of those people will be using powerpoles. At performance rallies, most of your ham radio operators will be using powerpoles. I highly recommend their use and a good set of crimpers if you’re going to switch a lot of stuff over to them. Once you do, you’ll realize you have a lot more configuration options. Now that solar charger can be adapted to charge any of the cars you drive. Your mobile radio can grab power from it or that big battery in the truck. I connect my rally car to a trickle charger with the same connection I use to power its mobile radio, and also the same connection I grab power for my tire pump. Following up on this post: “Getting Started: Social media for your rally team” I want to give you some more insights on pushing content to social media. The included graphic is my Recipes for IFTTT (If This Then That). I trigger events with Instagram now, and I’ll give you some more tips for successful social. A picture is worth MORE than 1000 words on Social Media. Text updates are all but ignored by your followers on Facebook, Twitter is getting that way, and Instagram was picture focused from the beginning. Try to post directly on the Social Site of choice if you can. While automation is nice and handy, this IFTTT shared post will hardly bee seen on Facebook, because it didn’t get posted directly to the site. Both Facebook and Twitter suppress outside shared posts, and Instagram is a straight up walled garden. You have to work with the system to overcome this. Imagine the sport of rally in the 80’s. You just got a postcard inviting you to the next rally and the results from the first event of the year still haven’t shown up in your mailbox (post office a.k.a horseback). You scour “Dusty Times” for a write up, and if you’re lucky, they might mention you in the final results for the weekend. Last week you spoke with Bill (the press guy from the rally) on the phone and told him the crazy story about how you passed car 403 on stage 2 with a millimeter to spare, and bullshitted about how your VW with a cam is faster than those silly Fire Arrows. Why social? Here’s 5 reasons: People love a good story (and love to live vicariously through you) ; You document your adventure for the future; Cyber spectators (more people are tuning in to get the scoop); You can get help at the event; Support from friends and sponsors! Run consecutively since 1998, the California Rally Series is presenting the CRS Rally School on Saturday, February 21st, 2015 with the Ridgecrest Rallycross event, the following day on Sunday, February 21, 2015. This is a great opportunity to show a new driver, co-driver, service crew member, or spouse what rally is all about. There is no one involved in the sport that will not benefit from this workshop. The class is packed with information and covers topics including: car prep, timing, stage notes, team management, and rally driving techniques. There is also plenty of seat time for drivers and co-drivers on practice courses designed to give them the “feel” of real competition. Experienced rally competitors will ride along with you and show you how to use the practice areas to develop and hone both driving and co-driving skills. Intense half-day classroom event with activities designed to teach you stage rally. How to get started in Performance Rallying from basic to advanced topics. Understanding controls and timing, the time card, and activities. 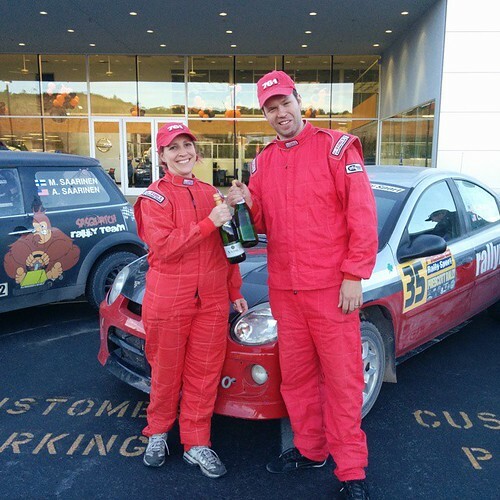 Drivers get seat time on our practice course with experienced rally drivers. Co-Drivers practice reading notes on a rally stage with experienced co-drivers. One on one in-car instruction from National Championship Competitors. Designed to give you the ‘feel’ of real competition! This is the best ‘bang for you buck’ rally school in the country! The Ridgecrest Rallycross is a timed event where competitors race both street stock and prepared cars around a closed course in a huge dirt lot. The tight course controls the vehicle’s speed while making driver control and skill a greater factor than raw horsepower. What is rallycross? Learn more here. Posted in Uncategorized	| Comments Off on Always be co-driving! Posted in Uncategorized	| Comments Off on Rallynotes LEGO Minifigs!